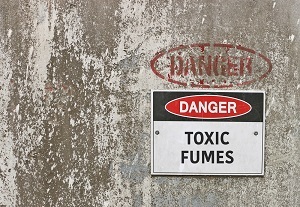 According to the Occupational Safety and Health Administration, hazardous chemicals include any chemical, asphyxiant, combustible dust, pyrophoric gas, or hazard which can cause physical damage or health concerns when exposed to the public. Unfortunately—as if they didn’t have enough to worry about—maritime workers are exposed to a number of hazardous chemicals on a daily basis, many of which can have extreme consequences on their well-being. Due to industrial construction, repair materials, and confined quarters, maritime workers are susceptible to many environmental dangers. Let’s take a look at some of the most common—as well as the most deadly. Asthma. When the fibers accumulate in the lungs, scar tissue can begin to form around the intruders and cause inflammation and obstructions, making it difficult to breathe. Pneumonia. The tiny sharp fibers act as small shards of glass when inhaled. These shards can easily cause lacerations in the throat and lungs, creating an ideal environment for fluid to pool and pneumonia to settle. Cancer. As the asbestos fibers accumulate in the lungs, they can also cut the membrane and float to other areas of the body. As white blood cells attempt to attack the foreign invaders, the immune system becomes compromised. With a deficient immune system and pockets of asbestos growing in the lungs and throughout the body, tumors and abnormalities can begin to grow. Ultimately, this type of exposure can lead to lung, gastrointestinal, and colorectal cancers, as well as an elevated risk for cancers of the throat, kidney, esophagus, and gallbladder. Cadmium is extremely toxic; so much so that acceptable exposure limits are one-tenth that of most other toxic metals. Once exposed, trace amounts of the metal will enter your bloodstream and begin to accumulate in the kidneys, lungs, brain, adrenal glands, pulmonary system, and even the cardiovascular system. Kidney damage. As it accumulates in the kidneys, cadmium can disrupt proper urination and disposal processes, which in turn can cause severe damage to the organs themselves. Cancer. Over time, cadmium pockets can damage cells and cause them to divide abnormally, break off, and accumulate into tumors and cancerous growths. Common cadmium-caused cancers affect the lungs, prostate, bladder, and adrenal glands. Digestive ailments. An accumulation of cadmium in the digestive system can lead to nausea, vomiting, stomach pain, and black stools. Mental illness. When cadmium deposits collect in the brain, they can damage cells and increase anxiety, stress, and violent behavior. Cadmium is so toxic that it causes a disruption in the tissues of the brain, which results in uncontrollable stress and violent thoughts. Heart disease. Cadmium deposits in the heart can break down essential tissue and damage cells, causing the heart to lose its strength and ability to pump blood. Skin ailments. Recently, a study on cadmium led by George Washington University’s Ami Zota, an assistant professor of environmental and occupational health, has found that cadmium can prematurely age cells. According to the Centers for Disease Control, benzene exposure can cause serious damage to cells, causing them to work improperly. For instance, benzene accumulation in the blood can disrupt white blood cells, which in turn can compromise the immune system. The severity of blood poisoning depends on the amount, route, and length of time in which the victim was exposed to the chemical. Cancer. One of the most serious effects of benzene exposure is the possibility of cancer. It has been found that long-term exposure to high levels of benzene can cause leukemia and liver, bone, and blood cancers. Organ damage. Benzene can also destroy cells in the lungs, bone marrow, blood, liver, kidneys, and central nervous system. Possible birth defects. Animals exposed to high levels of benzene have experienced low birth-rates and bone fragility in offspring. Symptoms of benzene exposure in a person completely depend on the individual, how much benzene they were exposed to, and how long they were exposed. If you work in an environment that may contain high levels of benzene, it’s important to discuss this with your doctor. Maintaining accurate and up-to-date medical records of your health can help prove that the exposure to benzene caused your ailment if you wish to pursue a personal injury case. Metal fume fever. Inhaling metal fumes can cause flu-like symptoms. Symptoms include chills, nausea, headaches, cough, fatigue, fever, pneumonia, muscle and joint aches, sore throat, and chest pains. Organ damage. Stomach ulcers, lung, kidney and nervous system damage can result from manganese exposure. Cancer. Manganese can disrupt cell growth and deteriorate healthy cells. Depending on the culmination of the compound, manganese pockets can lead to lung, larynx, and urinary tract or bladder cancers. Parkinson’s disease-like symptoms. When manganese builds up in a person’s system, it will eventually enter his bloodstream, and the brain, where it begins to kill off nerve cells. This causes Parkinsonism, in which there is no cure. While many people believe that Parkinson’s disease is purely hereditary, it can be caused by a combination of genetic and environmental factors. One of the most common environmental exposures blamed by medical professionals is manganese fume inhalation during welding. Welders in the offshore and shipyard industries are especially at risk for manganese overexposure, as welding often happens in constricted, poorly-ventilated areas of ships and rigs. Acids. Exposure to hydrochloric acid or sulfuric zinc chloride can cause severe burns. Toxic fumes and gases. Exposure to fumes produced by adhesives, caulking compounds, glues, tars, greases, oils, solvents, thinners can cause respiratory issues and in large amounts put the exposed person at risk for cellular damage. Carbon monoxide and other exhaust gases. Exposure to carbon monoxide and other toxic gases can cause respiratory issues, cellular degeneration, and death. One of the most important things you can do after exposure is to monitor your symptoms and actively maintain an open line of communication with your doctor. While not every symptom will be indicative of an exposure problem, your doctor will be able to analyze your symptoms knowing that you could’ve been exposed to a toxic material. Keep careful records of your visits with your doctor, in case —should you need to file a claim later, these documents tracking your symptoms could be critical to your case. For more information on how to begin the process of filing a personal injury claim due to a maritime exposure injury, contact our office today. We have spent our entire careers helping those who have been mistreated by their employers find the comfort and compensation they need for their recovery. Although your employer may not have intentionally caused your pain, this doesn’t mean that his failure to protect you isn’t cause for blame. Call us today at 713-921-4171 to learn more about chemical exposure liability and how you may be eligible for maritime damages and recovery benefits. Have You Been Exposed to Benzene While Working at Your Maritime Job?